An hour after playing his 130th and last game for Germany, and after scoring the winner with a trademark left-hooted hammer, Lukas Podolski was making an impromptu appearance on a sports chat show long after the TV coverage of the game had ended – still wearing his full kit complete with captain’s armband and boots. Still buzzing from the night’s events, he stood there with muddied knees and a wide smile spread across his face as the bemused technician fitted a microphone under his sweaty, grass-stained shirt. The fact that he’d taken the time to gatecrash the show, long after his media duties were over goes some way to explaining the extent of the heartfelt send-off he had received on the pitch earlier in the evening. After the referee blew the final whistle on Podolski’s Germany career, he walked slowly around the whole of the Westfalenstadion in Dortmund, not only applauding fans and aiming thumbs ups and waves into the crowd, but regularly clambering up onto the railings to be embraced and dish out handshakes and high fives. His teammates kept their distance, respectfully allowing him his moment. However, it soon became clear that this was going to be more than an obligatory lap of honour, and they left him to it. And while they were being rubbed down, debriefed or just taking a shower, Poldi was still out there, draped in Cologne flags, taking selfie after selfie with fans young and old. Whether the words or actions came from the fans, his fellow professionals, commentators, TV presenters, studio guests, or Joachim Löw, one thing was crystal clear: Lukas Podolski is an extremely popular man and one who will be missed on the international scene. He has a mixture of jovial local-boy-done-good with steely determination and professionalism. He may be a model professional, but he wouldn’t look out of place bouncing up and down in the Sudkurve at his beloved FC Köln. In fact, Podolski is so popular in some quarters, that there is a danger of his international career being seen as one big nice guy show. But 130 caps and 49 goals put him third in his country’s appearance list and fourth on the all-time goal scorer chart – and we’re talking about Germany here. Born in Poland, Lukas Podolski moved to Germany with his parents as a young child. The family settled in Bergheim, a town a few kilometers away from Cologne, a city that with which Podolski shares a reciprocated love. He may not have been born in Cologne, but he took his first footballing steps in the region, first with the local youth team in Bergheim before switching to the youth set up at FC Köln – eventually forcing his way into the first team during the 2003/04 season, aged 18. The young striker with blond highlights and a rocket of a left foot came into a struggling side, and despite hitting 10 goals in 19 games – a record for an 18-year-old in the Bundesliga – Podolski’s maiden season at his boyhood club ended in relegation to the 2. Bundesliga. It soon became clear that the second tier of German football was no place for a player who had already began his international career, winning his first cap after coming on as a substitute in a home defeat against Hungary and then travelling to Portugal as part of the Euro 2004 squad. Podolski and Köln tore through the 2. Bundesliga, finishing as champions with the forward ending the season as the top goal scorer with 24 goals in 30 games. Back in the big time Podolski hit double figures again, but again the team struggled again and were once again relegated – this time without their star striker. Now an established member of Jürgen Klinsmann’s squad, Podolski had agreed to join some of his national teammates at Bayern Munich after the upcoming World Cup in Germany. Aside from Brazil 2014, obviously, the 2006 tournament on home soil has to go down as the highlight of Podolski’s international career. The Sommermärchen saw the squad and fans revel in the wave of patriotism that swept through Germany as the team delivered victory and drama in equal measure on their way to an epic semi-final with Italy. For his part, Podolski was one of the stars and his double act with Bastian Schweinsteiger on and off the pitch became one of the lingering images of the summer. By now Podolski was an important part of the Germany set up, making Poland’s decision to not call him up a couple of years previous, where he was already performing in the Bundesliga, look unfortunate. Germany may have had to settle for third place in 2006 but Podolski was voted the tournament’s best young player and was ready to hit the ground running in Munich. But despite his position in the national team, he struggled at the Allianz Arena. Although he took him from Köln, Bayern coach Felix Magath didn’t see Poldi as a starter – a completely new situation for a player used to being one of the first names on the team sheet. Generally, all wasn’t well at the club and despite coming off of back-to-back domestic doubles, Magath and Bayern struggled and finished an almost unimaginable 4th in the league. The club reacted swiftly. Hitzfeld replaced Magath before the end of the season and in the summer came heavyweight signings including Franck Ribéry, Luca Toni and Miroslav Klose – the latter two providing stiff competition for an already partly marginalized Podolski. The future didn’t look good, especially as he hadn’t been able to recreate his Köln form in Münich, scoring only five times in a bitty season. The club brushed themselves down and bounced back instantly. The new investment paid dividends as they swaggered back to the top of the league, winning another double. It was Luca Toni, though, who was leading the line, finishing his first season in Germany as top scorer. Podolski watched on from the sidelines as his role as benchwarmer restricted his tally to a handful of goals. The writing appeared to be on the wall. Not even the appointment of Jürgen Klinsmann, a Podolski fan, in his third season in Munich helped turn things around, and an increasingly frustrated and clearly unhappy Podolski announced his return to FC Köln, his club. It seemed like the obvious move for the prodigal son to return to his old stomping ground, but it isn’t often that a struggling Bundesliga team is able to buy a 23-year old German international from Bayern Munich, and it took some huffing and puffing to get the transfer over the line. A price of around €10 Million was agreed, representing little or no profit for Bayern, and the sum was split and packaged in numerous ways to make it possible for Köln to finance the switch, including the proceeds of a friendly match between the two sides, and a crowdfunding-type scheme involving FC Köln fans. Podolski’s frustrations and lack of progress at Bayern hadn’t gone unnoticed by Joachim Löw. He had continued to put his faith in the forward, using him throughout the Euro 2008 qualification campaign and in the tournament itself, where he scored three times. But he wanted to see his players on the pitch week in week out. Podolski’s move back to Cologne would hopefully give him a full season of first team football leading up to the 2010 World Cup, with Germany looking to build on their runner-up finish in the European Championships. His six goals in qualification and two in the tournament kept up his international scoring ratio. But despite being a solid performer, he was never really in line to be the team’s talisman, often playing second fiddle to the prolific Miroslav Klose or, in this tournament in particular, Thomas Müller. His first season back in Cologne saw him back on the pitch but not really among the goals, but things improved and he was made captain, leading the club to a respectable mid-table finish the following campaign. Now back in the habit, Podolski went on to have arguably his best season since the heady days of 2006 as he scored 18 league goals – but as in his first spell at the club, his time ended with his own achievements being belied by the team’s relegation. Dropping down to the 2. Bundesliga again was unthinkable and his stellar performances throughout the season had attracted Arsene Wegner’s attention, and Podolski swapped the Rhine for the Thames. By this time, Podolski had represented his country almost one hundred times and scored 43 goals. And although his number of starts for Germany had been curtailed by the continued brilliance of Müller and the emergence of players such as Mario Götze, Marco Reus and Andre Schürrle, if fit, Podolski was in the squad and could always be relied upon. Playing mostly off the left, Podolski had a productive time at Arsenal, scoring 19 and assisting 14 in 60 league matches and notching 8 goals in 12 in the Champion’s League. But despite being popular amongst the fans, and almost definitely the players, Podolski was again unable to attain the level of importance and status he enjoyed at Köln and was ultimately not quite what Wegner was looking for. The Emirates bench beckoned, followed by a six-month loan spell at Inter Milan. Rather than being a fresh start, Poldi’s switch to the San Siro turned to be more of the same. The move may have signaled the end of his Arsenal career, but it didn’t turn out to be the start of one in Serie A. Nerazzurri boss Roberto Mancini never really seemed to fancy Podolski and first-team chances were kept to a premium. But just before his Arsenal career started on a downward incline, there was the summer of 2014. He signed off for the season as FA Cup winner and headed off to Brazil with his country, by now one of the most experienced players in the squad with more than a 100 appearances. He may have played a minimal part on the pitch during the tournament, his presence in the squad is not be underestimated, and his celebrations in Rio and back home in Berlin saw the high point of a love affair that began in the heady summer of 2006. While things were winding down on the international front, and Podolski had accepted his peripheral role in Löw’s team, his club career was far from over. After all, he had yet to turn 30. So after London and Milan, Podolski pitched up in Istanbul at Galatasaray. As is his style, Podolski threw himself into the challenge and has been a success in his two seasons, scoring a goal every other game and even hitting a cup-final winner. 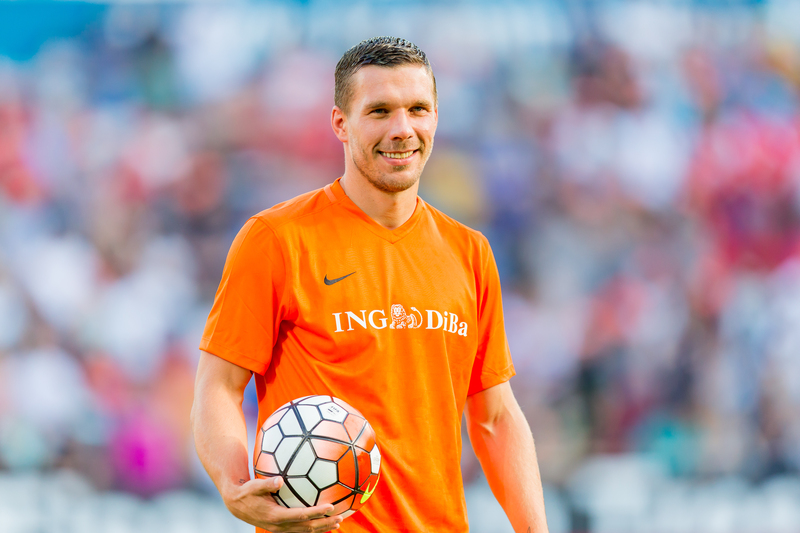 And now, after winning cups and leagues in three countries, competing at the sharp end of international tournaments, and lifting the World Cup, the Lukas Podolski story is set to continue with a new chapter in Japan, with Vissel Kobe. And regardless of what people think of his move to the J League, the fact is that Lukas Podolski has always moved to play football. Throughout his peak years he hasn’t been afraid to leave big clubs, move countries, or go on loan to get games – which is not a given when players can easily sit on the bench and be rewarded handsomely. And more than that, he managed to do it with a smile on his face. And if you think about it, how many footballers do you see who genuinely look like they’re enjoying themselves? Thomas Müller said jokingly after the England game that the fairytale ending was all a bit cheesy. He’s right of course. Popular striker signs off in front of a capacity crowd as captain and wins the game with a screamer into the top corner against the old enemy. It’s all a bit Roy of the Rovers, but who could begrudge a happy ending to a man that plays the game with a smile on his face? Jason, thanks for writing about “Poldi.” One reason why I became a fan of 1. FC Köln was Podolski. I enjoyed the way he functioned with and without the ball on the pitch, and it also helps some of my best friends in Cologne lured me to the Rhein-Energie-Stadion for a home match, and I immediately became an #EffZeh fan. When he joined my fave EPL side Arsenal, that was even better, even though many knew he wouldn’t likely be the “go to” guy at Arsenal. As you’ve rightly pointed out, he seems to approach football in a refreshing and entirely unjaded fashion, complete with that big smile. Most will also “underestimate” the number of goals he scored for Germany, and he did a decent job of it when he was called to “Die Mannschaft.” Thanks again; I enjoyed reading your article!